Great size for very large quantities! 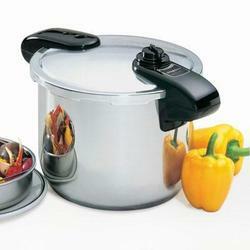 If you are doing quantity pressure cooking, this Presto 8-Quart Stainless Steel Pressure Cooker pot is the one for you. Two clip lock handles provide safer pressurization. Handles clip lock For safety and good pressurization. Pressure cooking Offers a cooking method for preserving flavors and nutrients.